Yesterday a man showed up at my front-door, pointing at his police badge when I peered out the window. I opened the door, and he confirmed he was a policeman. “As you probably know, your next-door neighbors had a pretty big party on Friday, October 30,” he explained, as I let him in. Of course, I knew. There was a bunch of street noise while my child was trying to sleep… the party was so big there were security people in the street directing traffic. Ugh. Basically some creep, had gone door-to-door up our street, holding up my neighbors at gunpoint and robbing them in their homes. The policeman asked if we had cameras. I immediately became nervous about the policeman—I’d just opened the door for him. I mentioned, “Well we have a dog, so we have one extra layer of security.” He’s not just a dog either… he’s a 60-pound collie. He was standing right next to me. He’s a spitting image of Lassie, and every bit as smart and strong. I let him know that we do have cameras, but they weren’t pointed at the front door that night (although, you bet they are now). He asked me a few more questions, gave me his card, then left. Now all I can think about is how that night could have ended so differently for us. Why were we so lucky to be spared? Maybe just a good dose of luck. Or maybe when the creeps were picking houses, ours just wasn’t the easiest target. 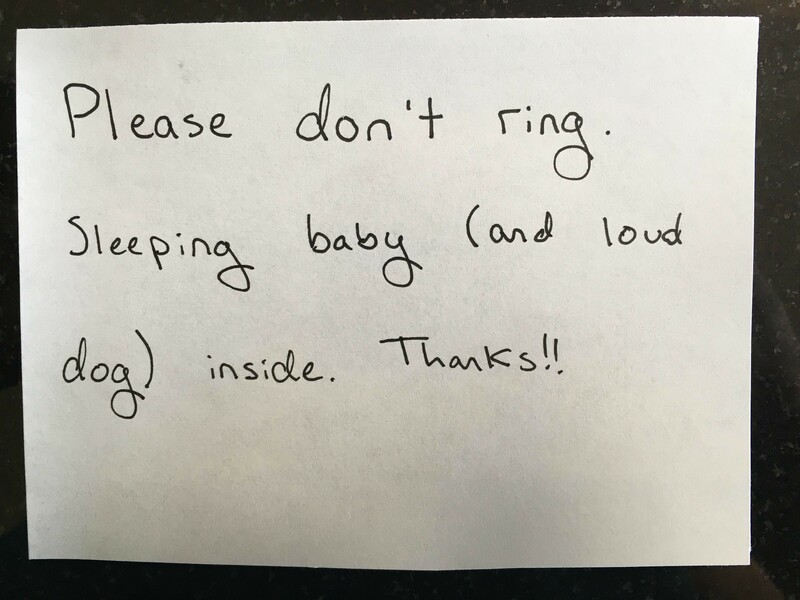 I keep a sign over our doorbell, asking delivery people (and whoever else) to please not ring the bell, because there’s a sleeping baby inside. 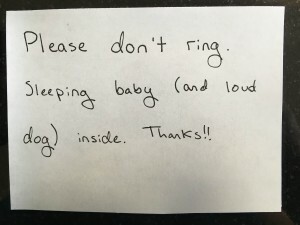 Whenever someone rings the doorbell, our dog goes ballistic, and the barking is actually what awakens our daughter. So I mentioned our dog on the sign. We may have just been lucky that night, but it’s possible that that little sign led the creeps to choose another house instead of ours. Either way, be safe, people! Think twice about opening the door for people you don’t know. 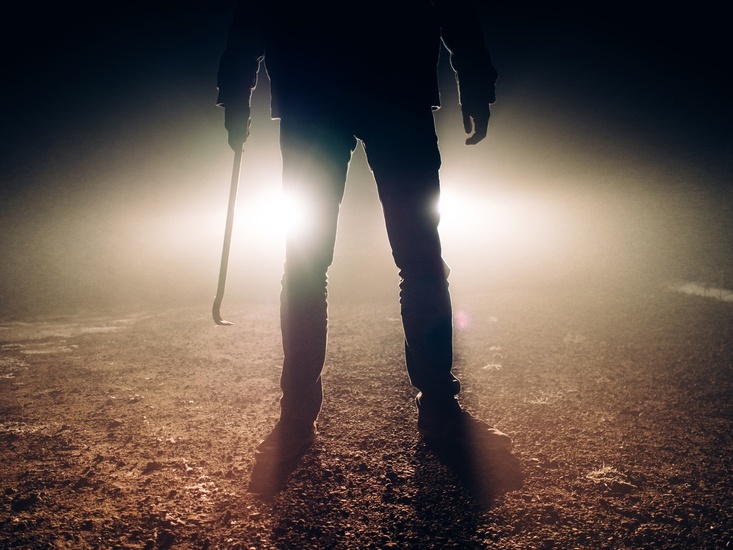 Don’t forget to lock your doors and consider a security camera pointed at the door–both as a deterrent and for evidence in case something does go down in your neighborhood. I’ll also be putting up a second sign to let people know we have cameras, too (the Amazon link is below, for the sign I just ordered and the dropcam we use). Please share this important reminder, to help keep your loved ones safe. If you enjoyed this article and you’d like to see more from Mama Lovejoy, you can “like” my Facebook page. You can follow @MamaLovejoy1 on Twitter, Instagram or Tumblr, check out www.mamalovejoy.com, or please share Mama Lovejoy with your friends. Thanks!! This entry was posted in Mama Lovejoy and tagged #BeSafe, #Burglary, #Cameras, #Criminal, #Danger, #Deterrent, #DontAnswerDoor, #Gun, #Gunman, #Gunmen, #Gunpoint, #HomeSecurity, #ImportantReminder, #Nap, #Naptime, #Party, #Police, #Robbery, #Sign, #Strangers. This is scary. I think your sign was a good deterrent.